A Farsi text alerts a computer screen alerts an Internet user trying to log onto social networking site Facebook in Tehran that access to this site is not possible, May 25, 2009 photo. Iran, with a little help from China, is putting together its own closed version of the Internet to keep its citizens from viewing material it considers unsuitable. Experts say the project is struggling and unlikely to work. The project, begun a few years ago, is driven by concerns over national security as well as censorship, according to Mahmoud Enayat, director of Small Media, a London-based organization that works to increase the flow of information in closed societies. Enayat says the Iranian government concluded that it was facing security threats whenever its government and banking information moved on the Internet through computer servers outside the country. “So what they started doing was to build infrastructure inside Iran. So that allows them to keep the traffic internally; and also they can manage it,” Enayat said. Around 90 percent of the government’s websites have already been moved onto Iranian-based servers, according to Freedom House research analyst Adrian Shahbaz. “There is no doubt the Iranian government has been looking to other repressive countries, such as China, as a model and even vendor for the sort of sophisticated hardware and software controls that it needs to maintain strict control over how Iranians use the Internet,” said Shahbaz. Iran, a nation under international economic and political sanctions, faces special difficulties in buying the equipment and expertise to deploy sophisticated systems that can provide the security and control it is seeking for online communications. As a workaround, Shahbaz said Iranians are trying to build many of their own surveillance systems from scratch and pirating software demonstration versions to tailor them to their needs. Some equipment is still being acquired clandestinely, said Enayat. But more often, he said the hardware comes from Chinese companies or proxy companies in Malaysia or Thailand. But Galperin notes that while there is evidence that Iran is using Chinese networking hardware in its project, the extent of Chinese help is still unclear. 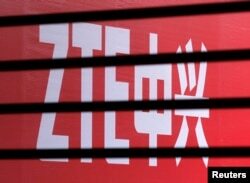 The company logo of ZTE is seen through a wooden fence on a glass door in Beijing, April 18, 2013. One example of Chinese assistance came to light last year, according to Shahbaz, when it was learned that China’s ZTE company had signed a contract with Iran to provide more than $130 million in surveillance and interception equipment. He said a there was also a 2010 deal for China to sell Iran “deep packet inspection” technologies that could monitor Internet communications. All of this, Shahbaz said, is designed to enable Iran to set up its internal Internet services and crack down on access to regular Internet services. The internal network is also designed to prevent Iranians from surfing the Internet, even the internal one, anonymously. “All Internet Protocol [IP] addresses are going to need to be registered, and that’s going to make it easy to identify who is looking at what websites at any given time,” Shahbaz said. And Enayat notes that Tehran is looking to block access to commercial tools and services that large numbers of Iranians have already used to bypass filtering of websites such as Facebook and YouTube. That is exactly what happened ahead of the June presidential election, said Galperin, when authorities turned off some of the Internet’s encrypted communications to make secure browsing more difficult. Iran’s National Information Network project would create two internets: one based on domestic servers, the other a very slow and filtered international Internet. 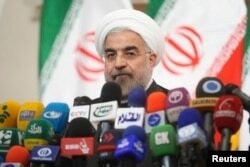 President-elect Hassan Rouhani speaks with the media during a news conference in Tehran, June 17, 2013. ​Even the former Iranian president, Mahmoud Ahmadinejad, had a Facebook page. And newly-elected President Hassan Rouhani has come out recently in favor of Facebook and said attempts to filter Internet access were futile, despite the fact that Facebook is blocked in the country and Internet filtering continues, said Galperin. Jeffrey Carr, an analyst with Taia Global, a cyber security corporation in Washington State, says there is a good reason Iranian leaders feel this way. Carr predicts that Iran will either back away from its project or have to modify it extensively.